i Click 'view all' to instantly compare this ok deal with offers on other top carry on luggage. 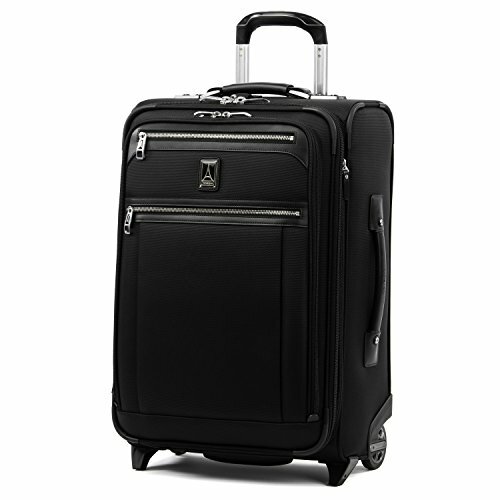 Travelpro Luggage Platinum Elite 22" Carry-on Expandable Rollaboard is currently selling at $254.99, approximately $9.95 higher than average. With a lowest price of $206.99 and an average of $245.04 it is selling on the high end of its usual range. Price volatility is 1.19% (meaning it does not change often), so you might have to wait a while for the price to drop. Right now this product is a recommended 'ok deal'. Compare the current price, savings (in dollars & percent) and Buy Ratings for the top Carry On Luggage that are closely related to Travelpro Luggage Platinum Elite 22" Carry-on Expandable Rollaboard. Here is how Travelpro Luggage Platinum Elite 22" Carry-on Expandable Rollaboard compares with other leading Carry-On Luggage. Never settle. Designed for the traveler who expects top performance without sacrificing style, the 22" expandable carry-on Rollaboard suiter handles short to medium-length trips with polish. Intelligent function comes in a tip-resistant tapered expansion design, built-in wrinkle-resistant suiter and deluxe tie-down system with easy-access accessory pockets, along with a removable, quart-size wet pocket that is TSA compliant and perfect for toiletries. On its exterior, premium fabrics, genuine leather accents, and chrome zippers deliver effortless sophistication, while an adjustable PowerScope extension handle minimizes wobble and keeps you rolling smoothly on two Rollaboard wheels. Built-in USB port lets you power up on the go, while a dedicated powerbank pocket for your back-up battery adheres to faa regulations. This Fit to Fly carry-on rollaboard has been sizer been tested to accommodate overhead bin space on most major US airlines. Fully expanded Carry-On may not meet airline restrictions. Backed by our built for a Lifetime Limited Worry-Free Warranty that covers the cost of repair for damage from airline or other common carrier for the life of the bag after registration under the trusted companion promise. FeaturesExpandable, carry-on Rollaboard suitcase with external USB port and dedicated powerbank pocket meets faa regulations for carry-on and checked baggage. Powerbank not included.High-performance sealed ball bearing wheels ensure a smooth roll and lasting durability. Patented PowerScope airline-grade aluminum extension handle minimizes wobble and has four stops at 36", 38", 40" and 42.5" to accommodate users of different heights.Built-in fold-out suiter keeps clothes wrinkle-free during travel. Deluxe interior tie down system includes built-in accessory pockets for quick access to essentials. Removable quart-sized wet pocket is TSA compliant and perfect for storing toiletries.Backed by our built for a lifetime limited worry free warranty that covers the cost of repair for damage from airline or other common carrier for the life of the bag after registration under the trusted companion promise.